Rinse, dry, and slice the stem and blossom end off of the tomatoes. Slice the remaining tomato into rounds that are 1/3 inch thick. Place in a medium sized bowl. Add 1 cup of flour into a small bowl. In another small bowl, whisk together the eggs and milk. In yet another bowl, combine the corn meal, panko, salt, and pepper – to make tomatoes with a bit of zing, add the cayenne here, but they are plenty tasty without it. Arrange the four bowls in this manner from left to right: tomatoes, flour, egg wash, and panko mixture. Place an empty plate next to the panko. One slice at a time, press tomatoes into first the flour, then into the egg wash, press the panko mixture all around the tomato piece, and place on the plate. Repeat until all the tomatoes are well coated. Add enough vegetable oil to a large fry pan until the oil is approximately 1/2 inch deep. Set a plate covered with a few paper towels nearby. We are making some dishes here, aren’t we. It will all be worth it. If you are a neat freak, you can stop here and wash the bowls. Turn the burner on to medium high. Every now and then hover your hand 2-3 inches over the oil. Please be mindful of hot oil and do not put your hand too close. When the air above the oil feels very hot, add one small tomato slice to serve as a test. If the oil is hot enough, it will bubble vigorously around the test tomato, cooking it quickly. When the sides of the tomato are brown, use tongs and check to see if it is well browned on the bottom. If it is, carefully flip the tomato and brown the other side. Remove it to the paper towel covered plate. Slice into it with a fork. It should be softened, nearly creamy inside. If it is hard, the oil was not hot enough – fortunately, the time you just spent frying one up and testing it probably brought the temperature up just enough. Add the other tomatoes a few at a time. You want them to have room to float around and not be all smashed together. If they are crowded, they will be oily and we want them very crispy. How many you tomatoes you should add will depend upon the size of your fry pan and your tomatoes. The frying happens very quickly once the oil is hot. So stand there wearing a good apron, watch, and flip as needed. Should your oil start to smoke, ever so slightly reduce the heat. With each addition of tomatoes, the temperature of the oil will reduce a little. Tomatoes are cooler than the oil. The oil temperature will rise again as the tomatoes cook. The key to prevent smoking is to keep on adding more as you remove those that are done. This helps keep the oil temperature fairly stable. Do not stop to go chat on the phone or the kitchen will not remain smoke free. Carefully add more oil as needed to keep the tomato slices floating. Add another layer of paper towels onto the first layer of fried tomatoes so you can stack them while you are frying. Keep the fried tomatoes hot by covering them with yet another paper towel. After all the tomato slices are fried, let them cool just a bit (a couple minutes) and then enjoy them just as they are – or salt them while very hot – or let them cool until you can pick them up by hand and dip each delightful round into a little Blue Cheese Dressing! 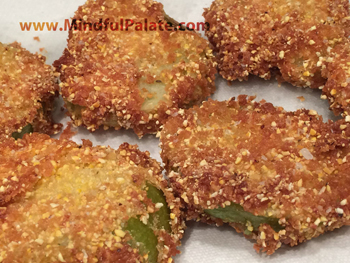 This entry was posted in Appetizer, Side Dish, Technique, Vegetable and tagged delicious, fried, green, tomato. Bookmark the permalink.